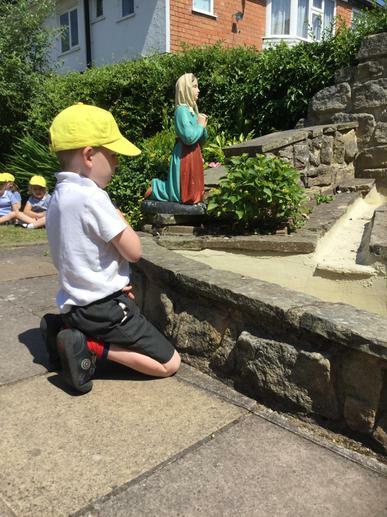 Reception have been learning about Saint Bernadette and our lady of Lourdes. 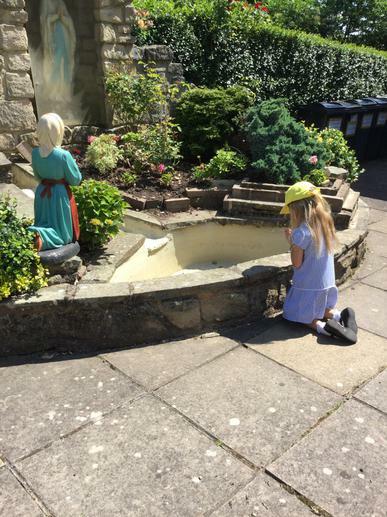 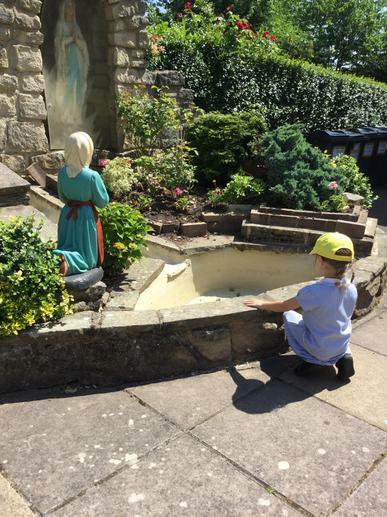 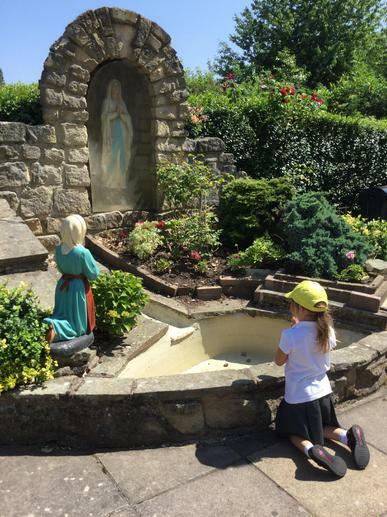 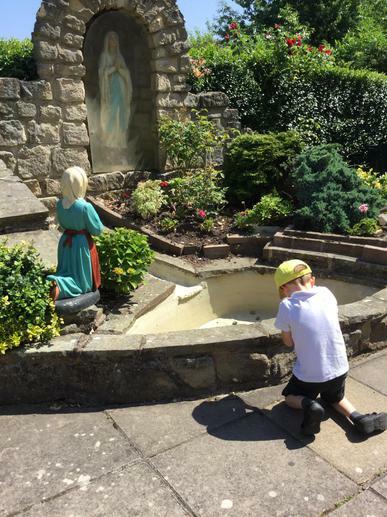 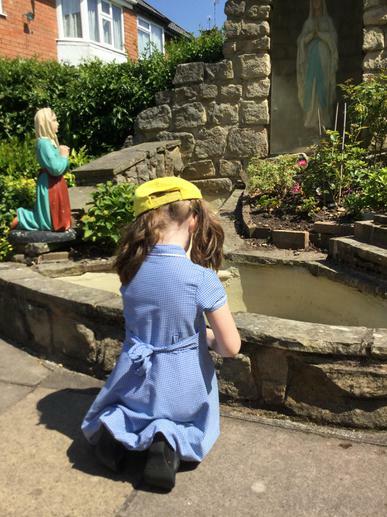 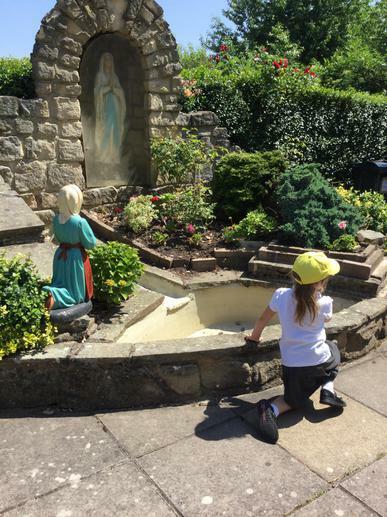 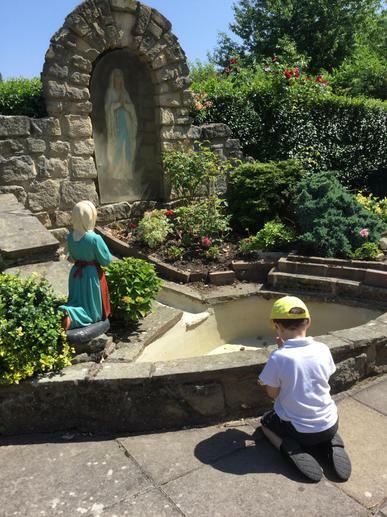 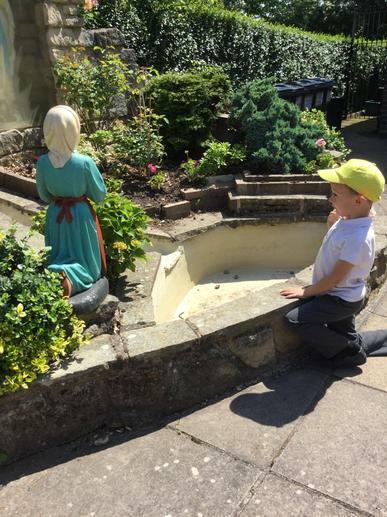 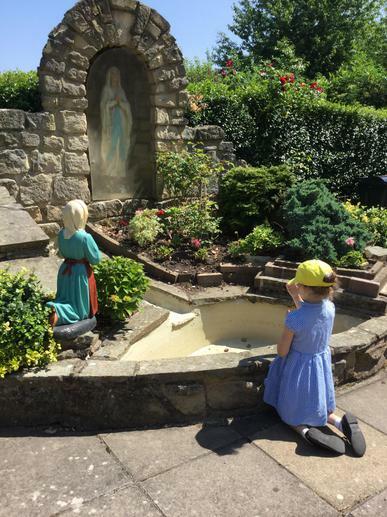 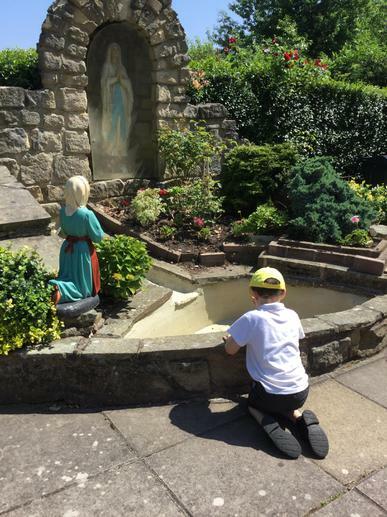 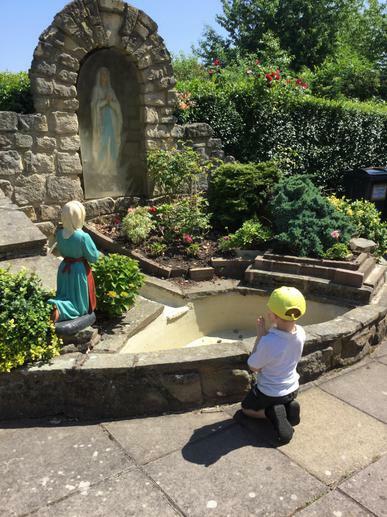 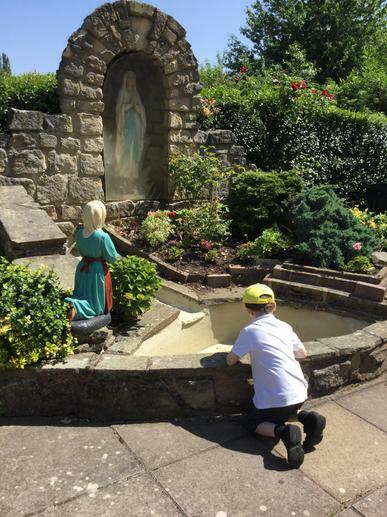 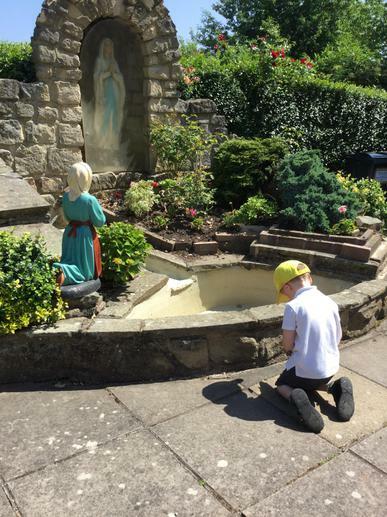 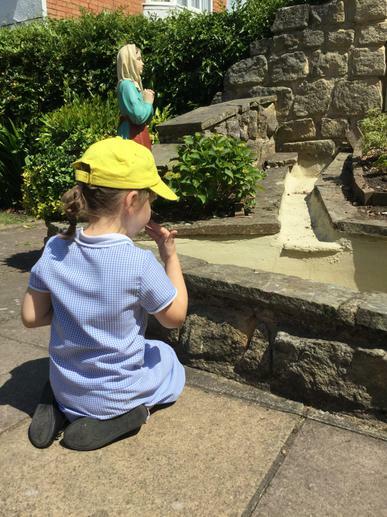 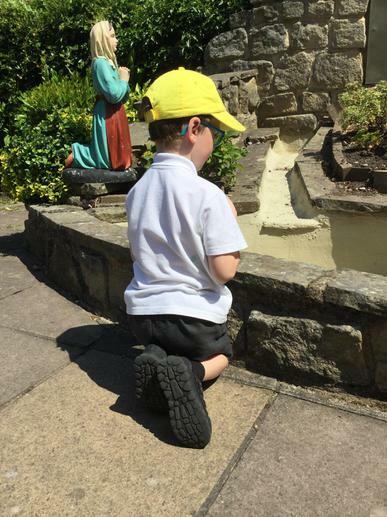 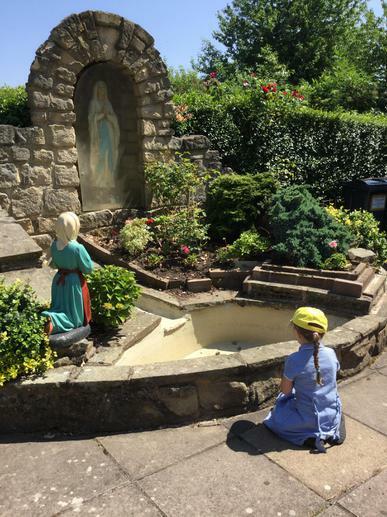 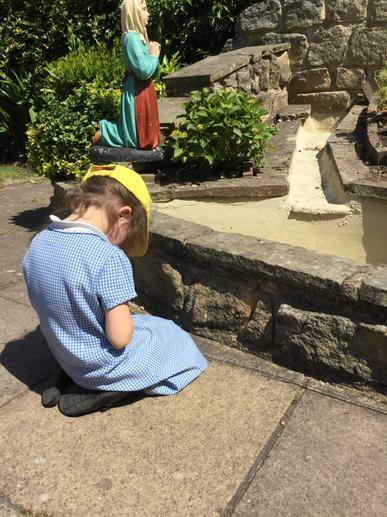 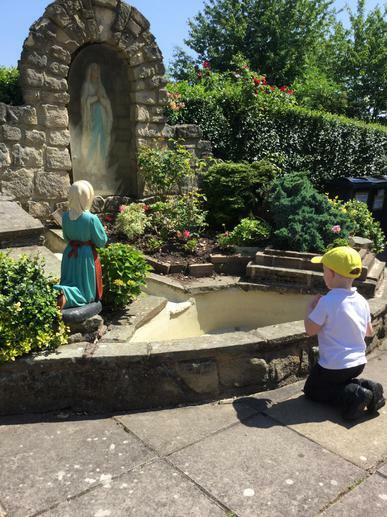 We made a little pilgrimage to our school grotto and asked Mary to pray with us. 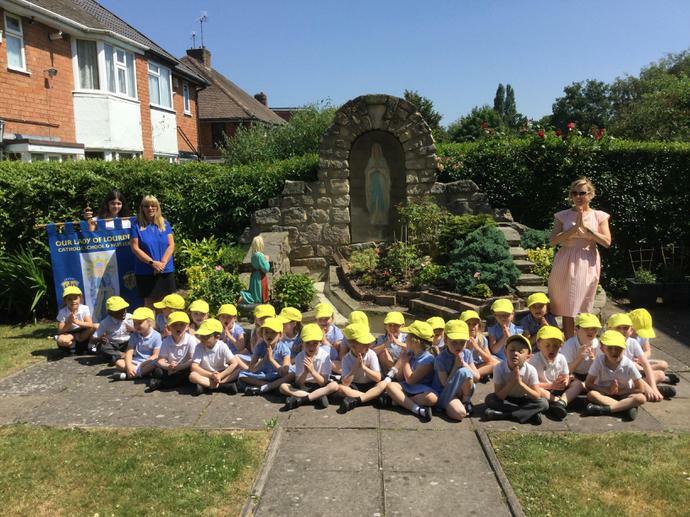 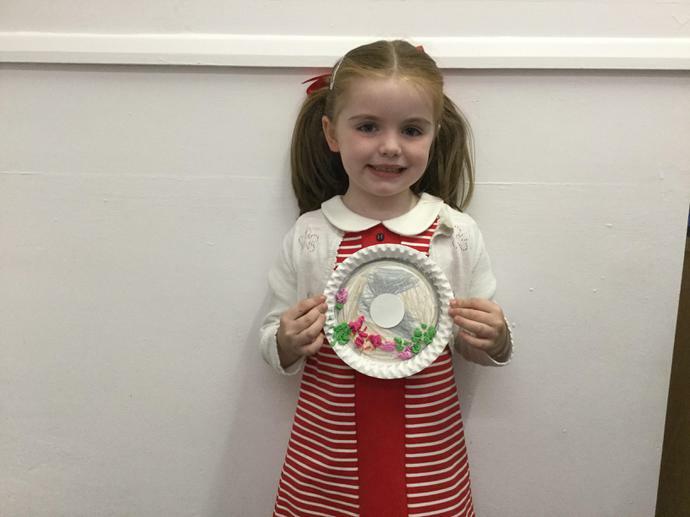 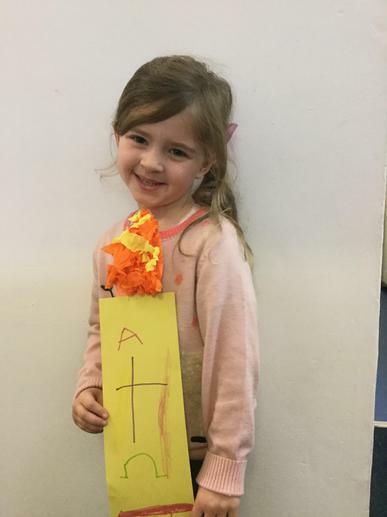 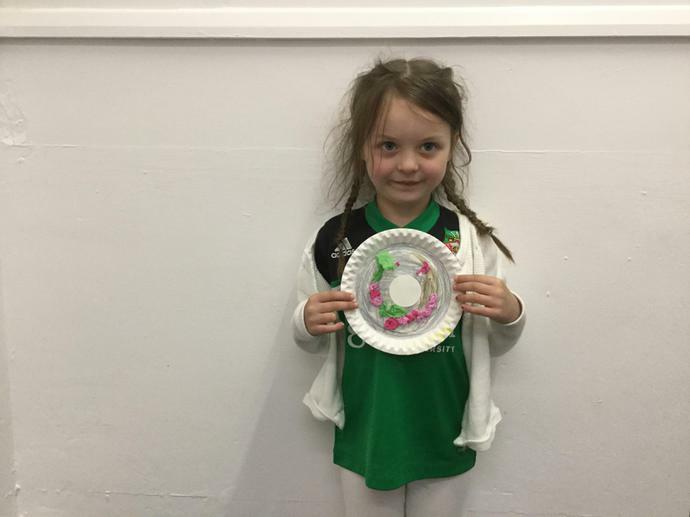 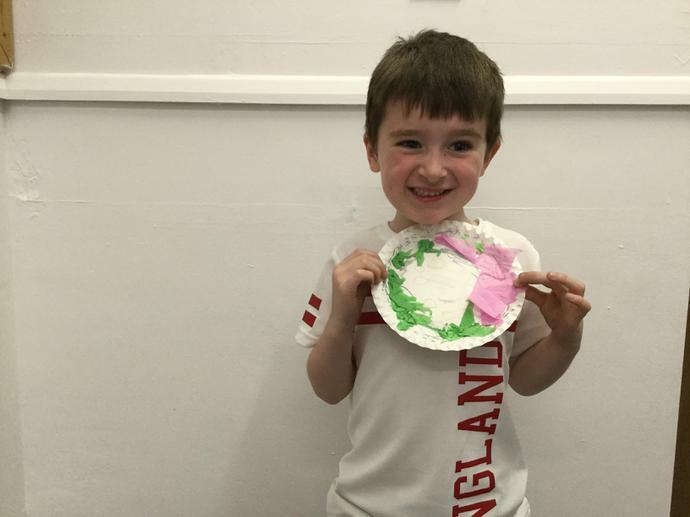 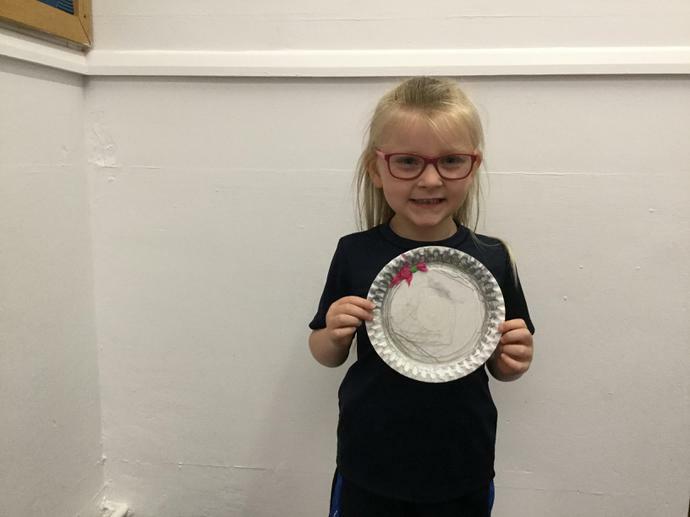 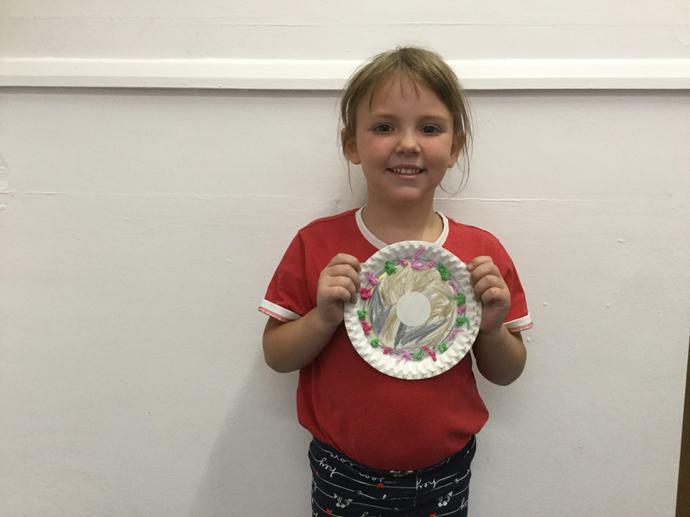 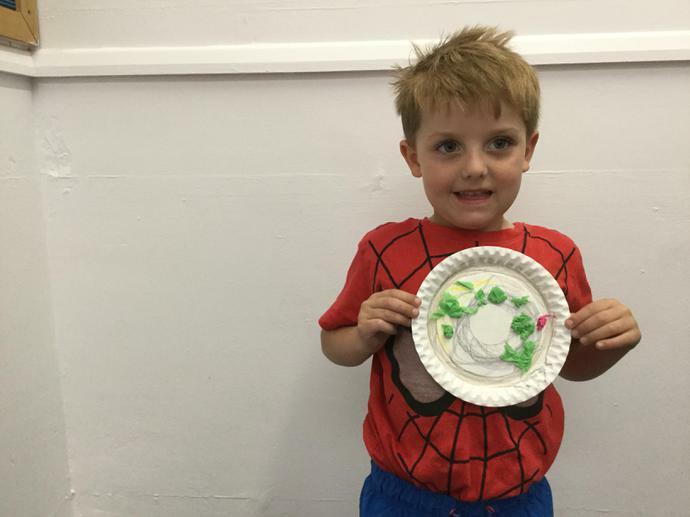 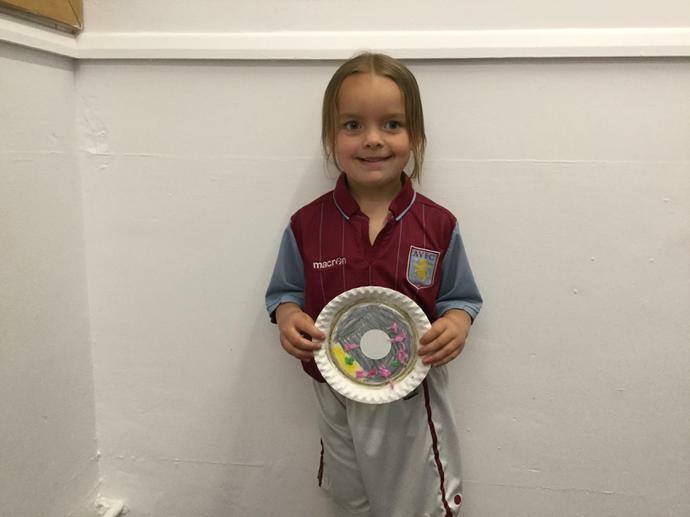 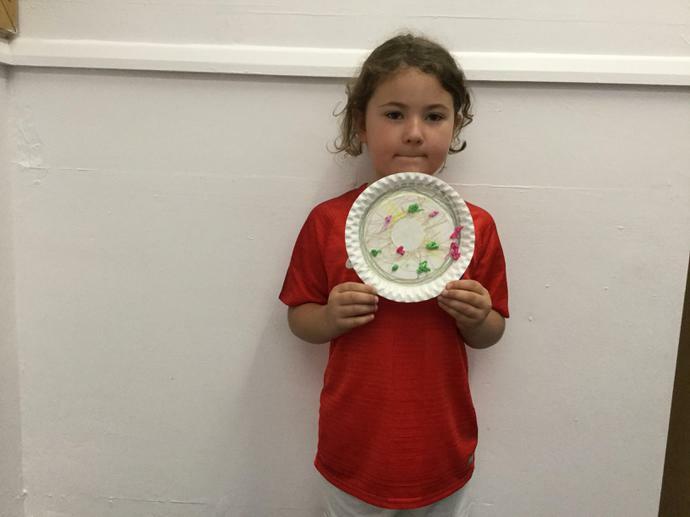 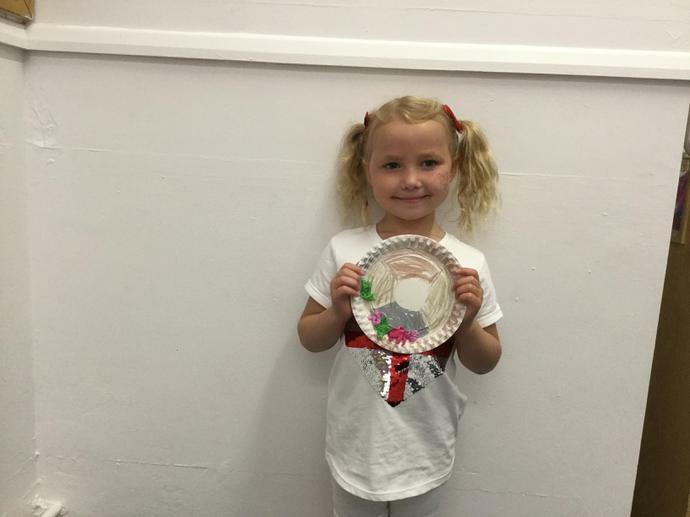 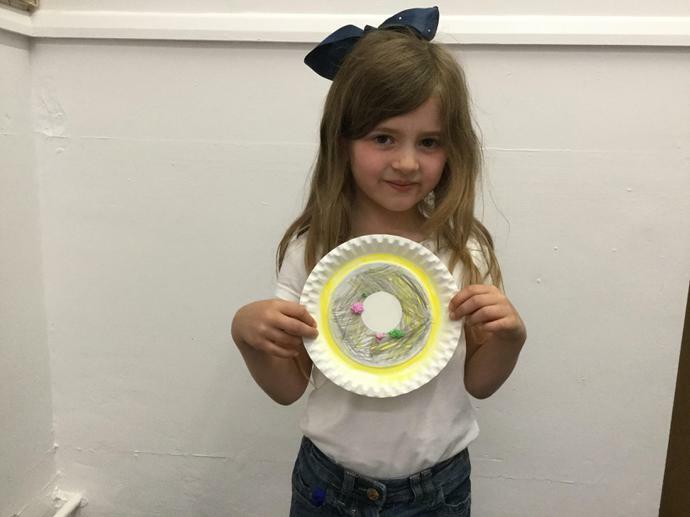 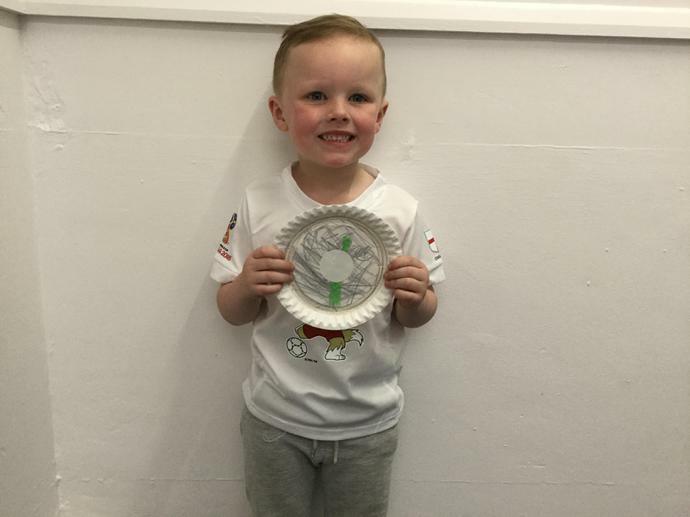 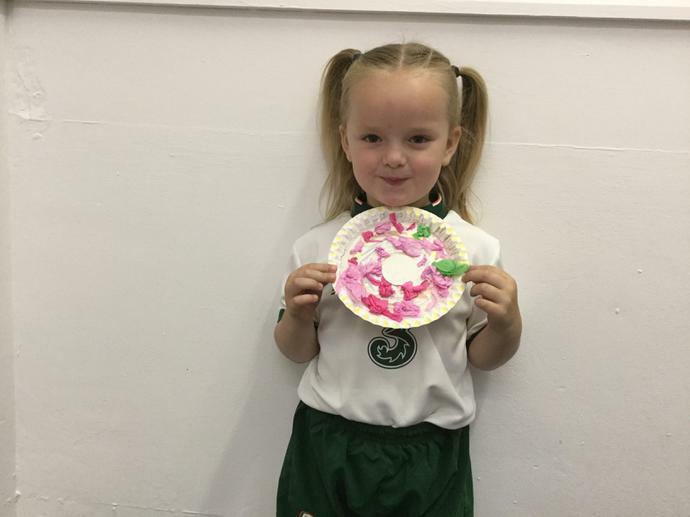 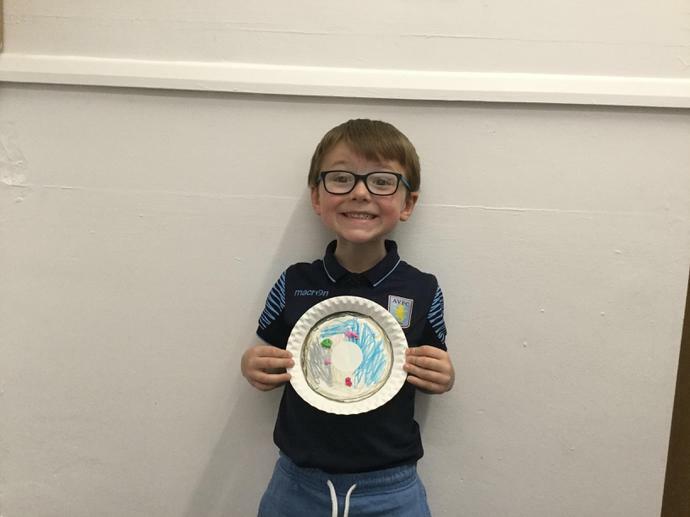 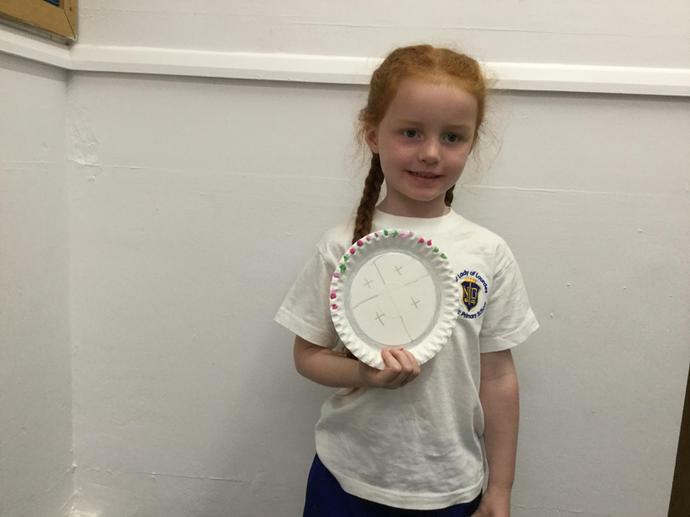 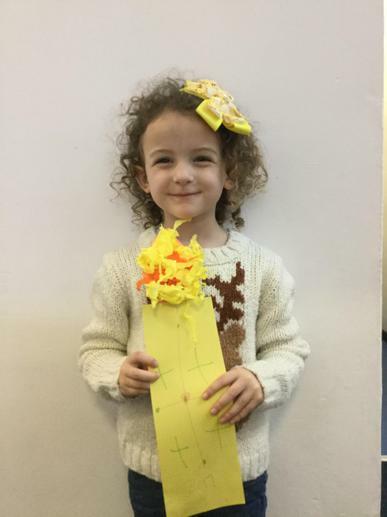 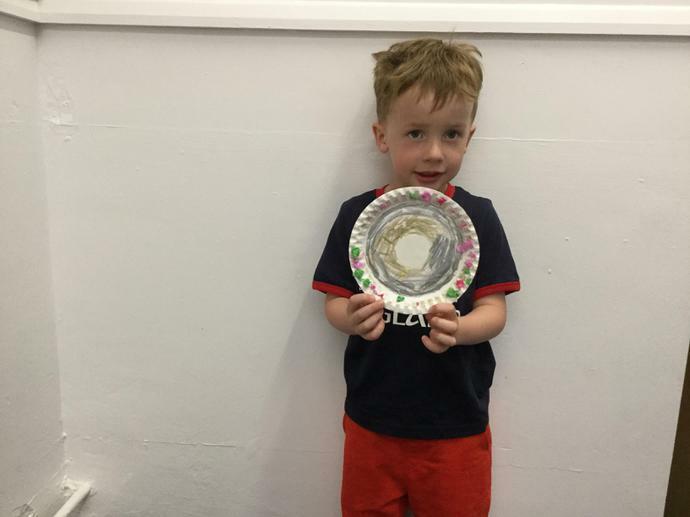 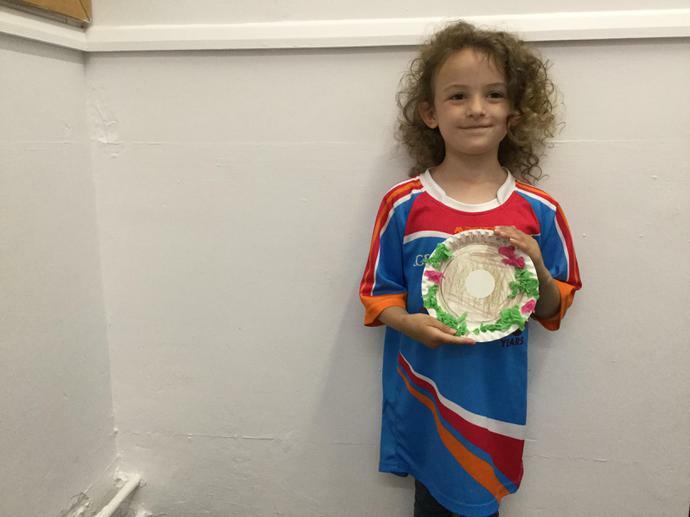 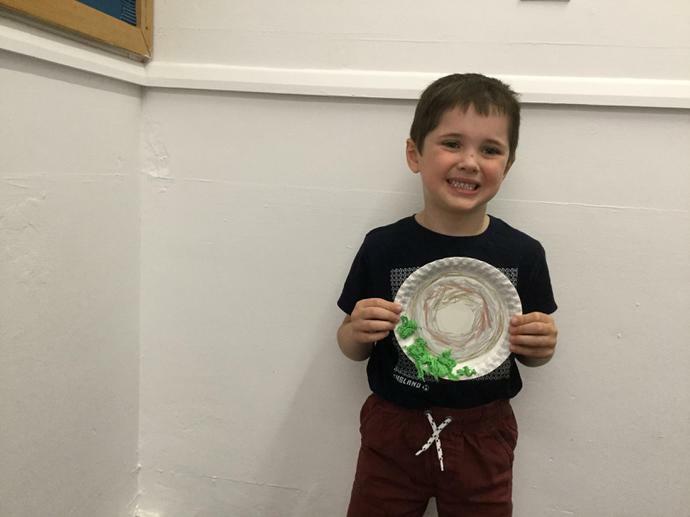 Reception made their own Monstrance to celebrate the feast day of Corpus Christi. 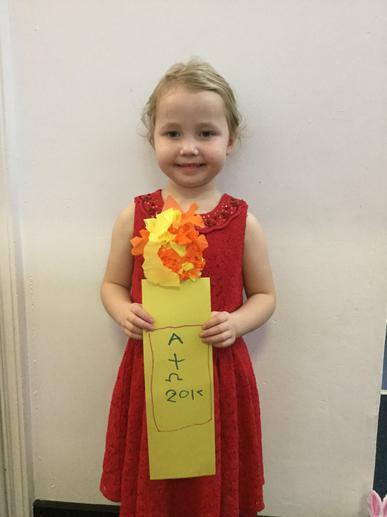 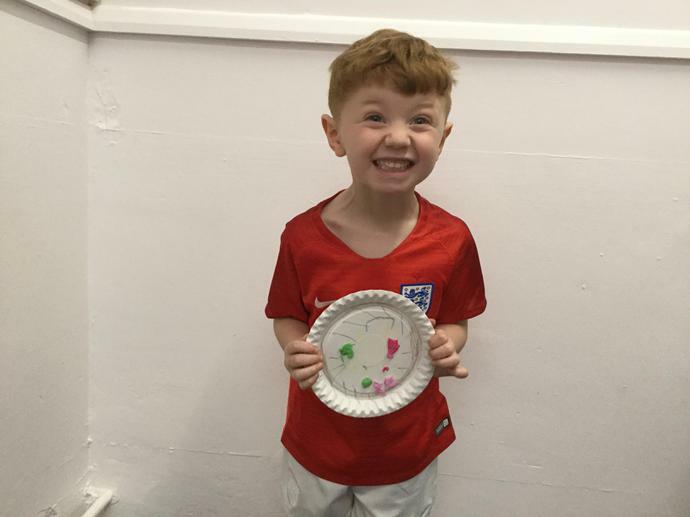 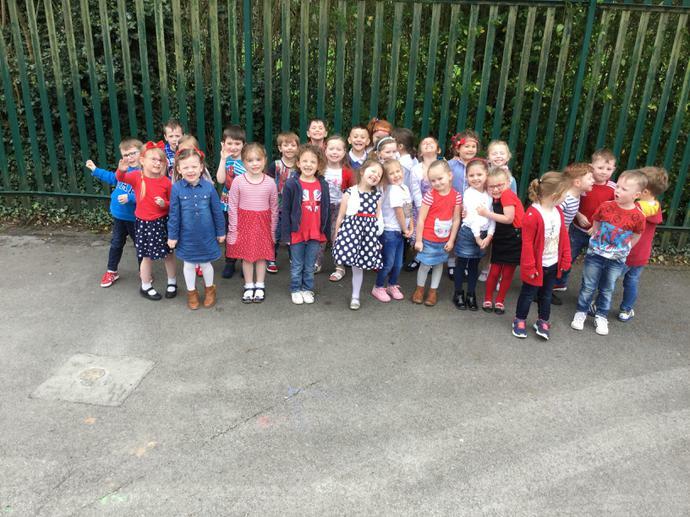 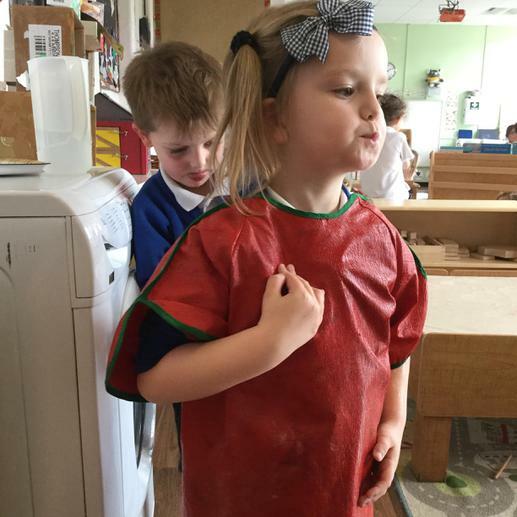 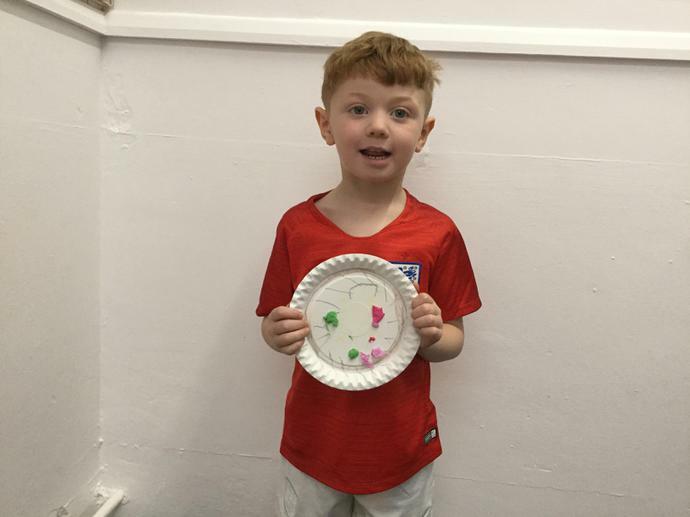 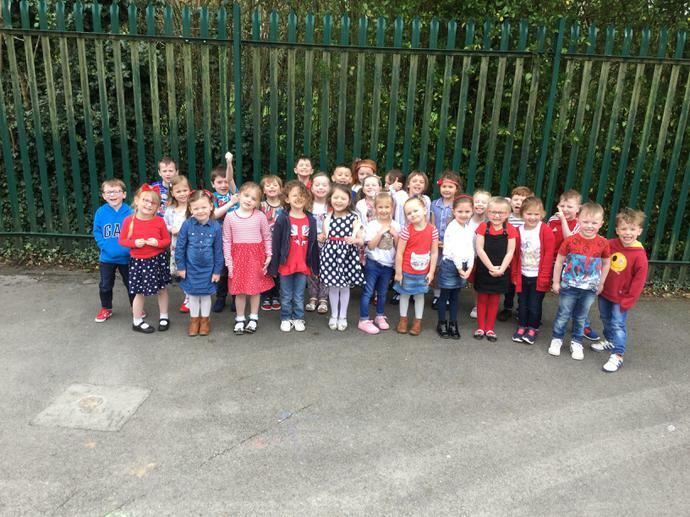 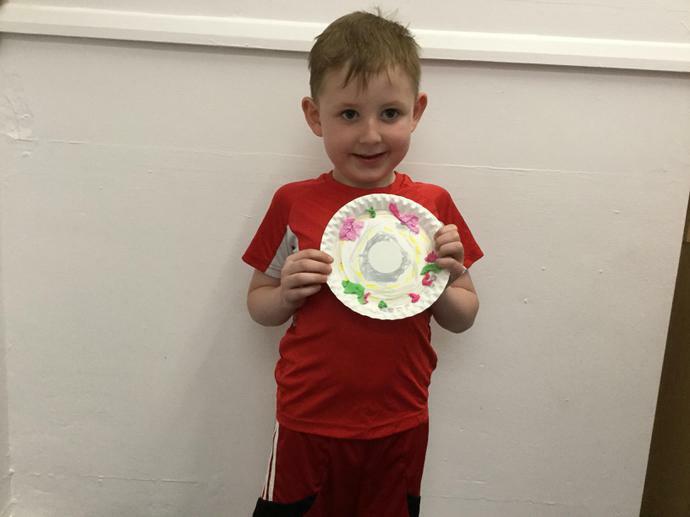 Reception children wore red to celebrate Saint George’s day. 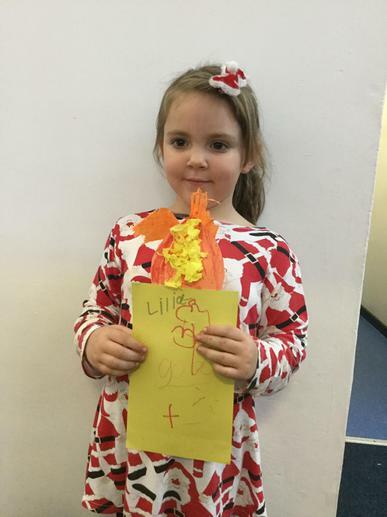 We loved learning about brave and fearless Saint George. 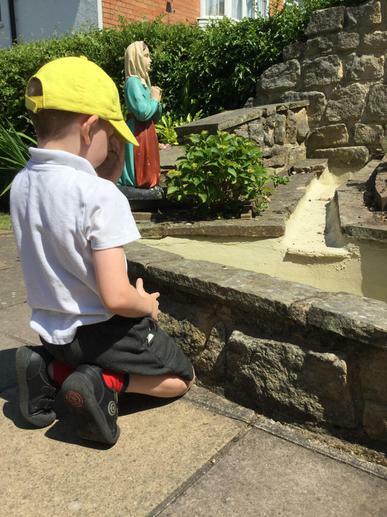 We talked about how we can be brave and have faith just like him. 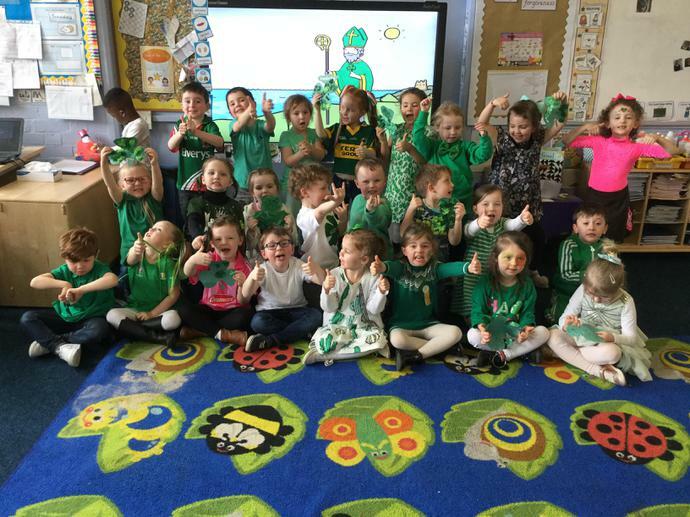 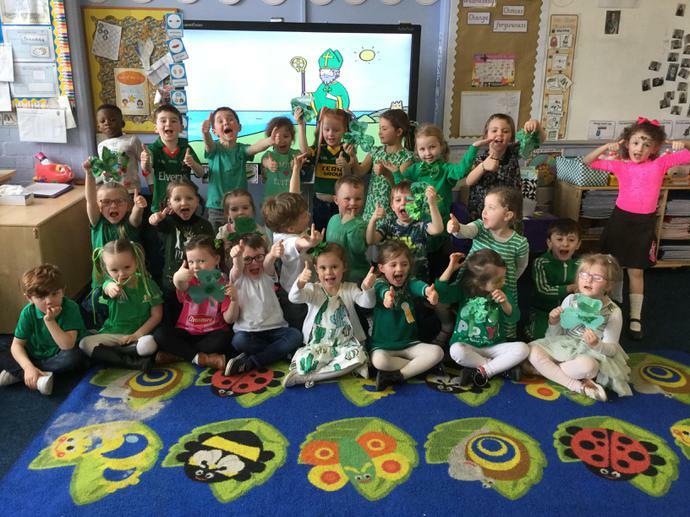 Acorns celebrate Saint Patrick’s day in their beautiful Irish colours. 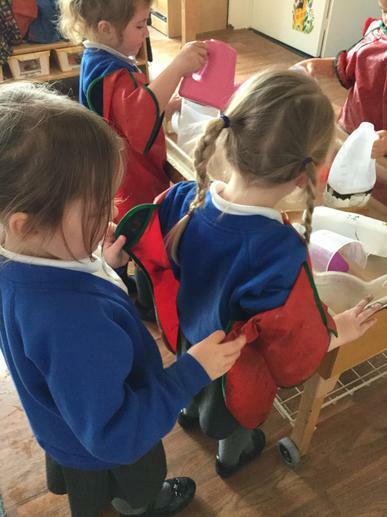 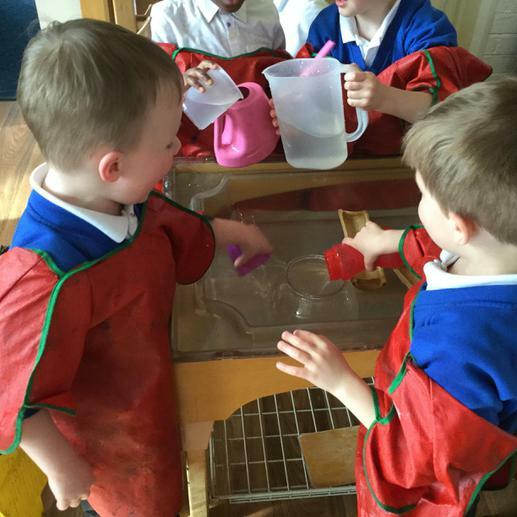 During lent acorns are thinking of the importance of serving others. 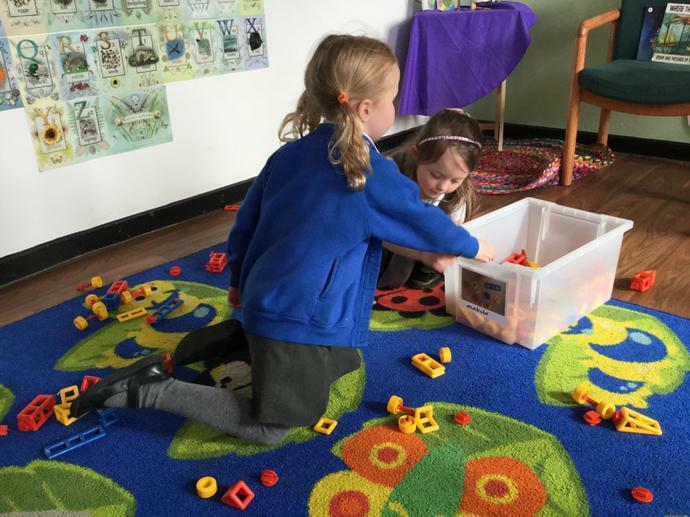 Can you help a friend? 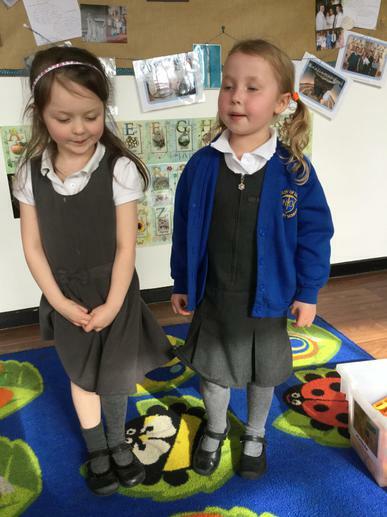 We finished the week by thinking about others. 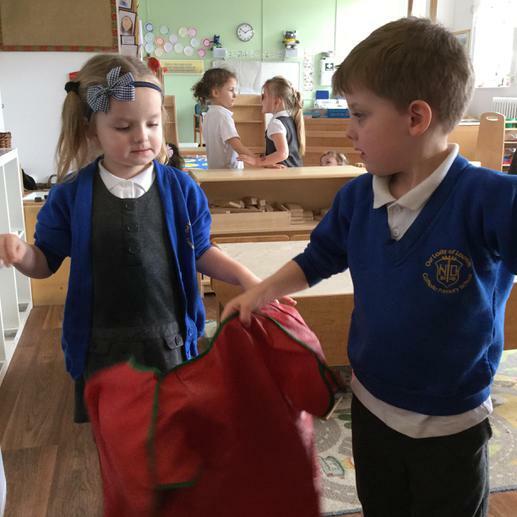 We each chose a name and told our class mates the things that we love about them. 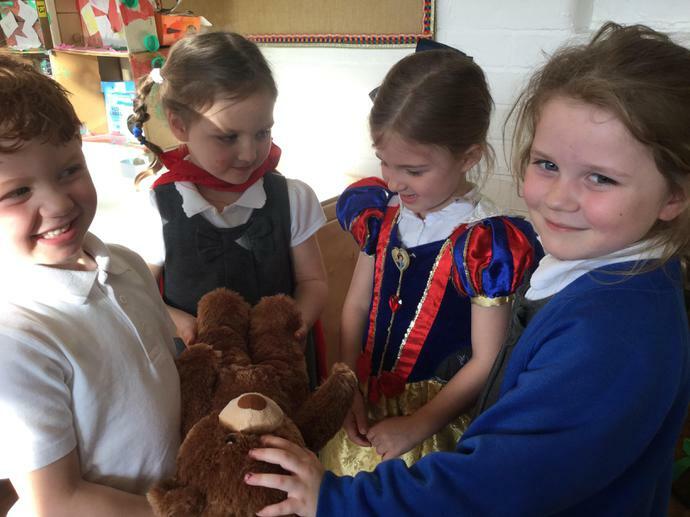 Coco the bear loves coming home with us. 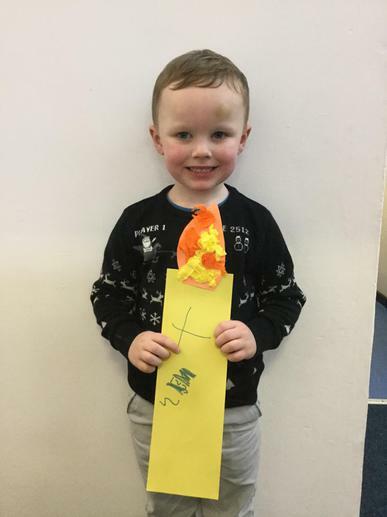 He always pays a visit to Father Sean during Mass on Sunday. 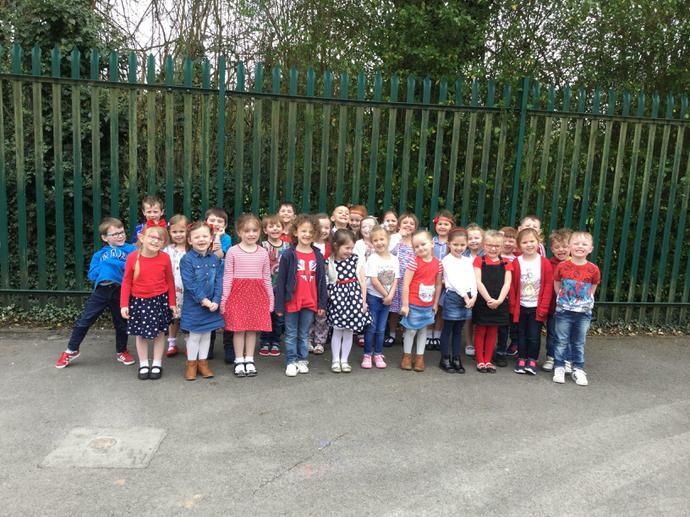 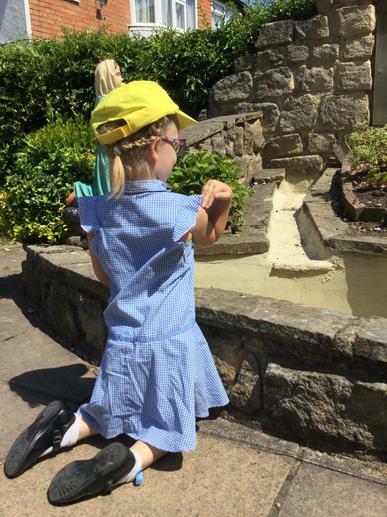 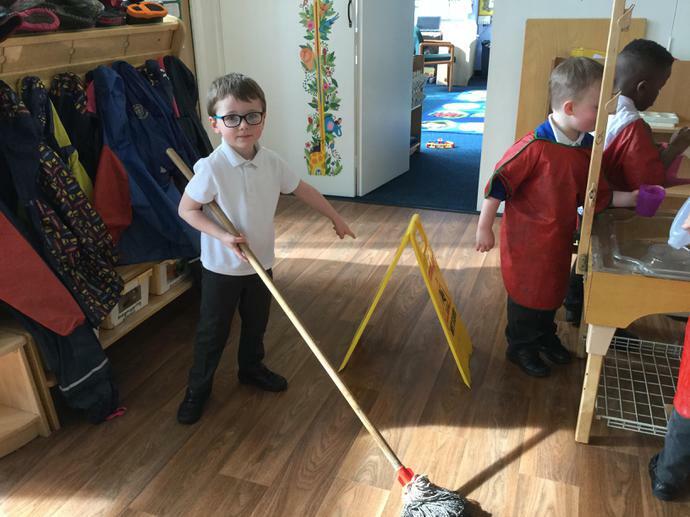 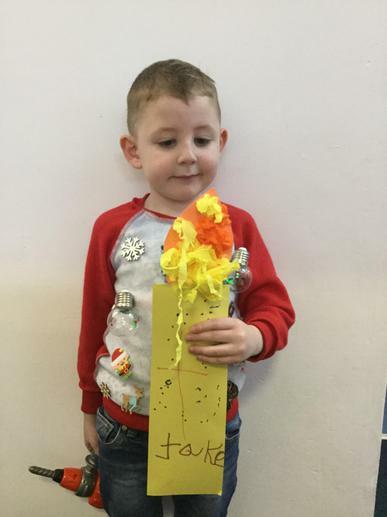 We are actively supporting our classmate by helping to raise funds for children with CF. 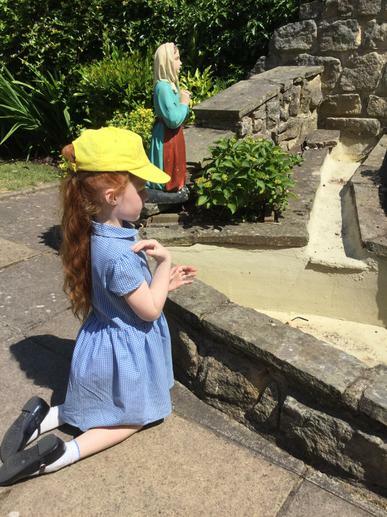 Aoife told acorns that god made our hands to help not to hurt. 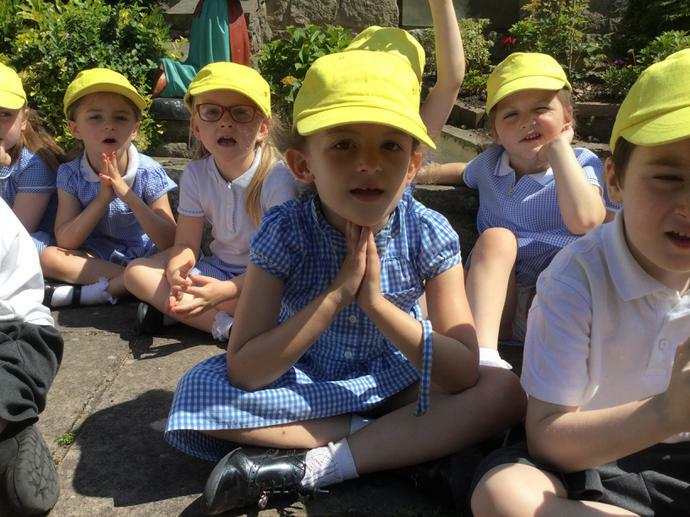 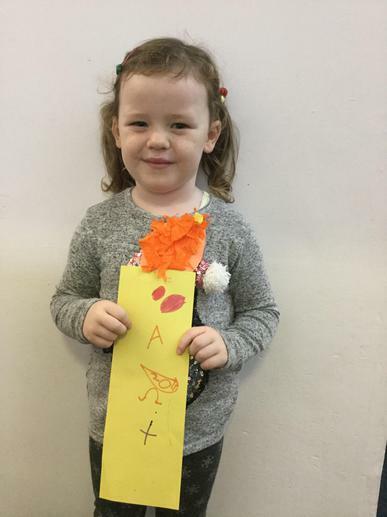 Children in reception writing prayer intentions for those who care for them. 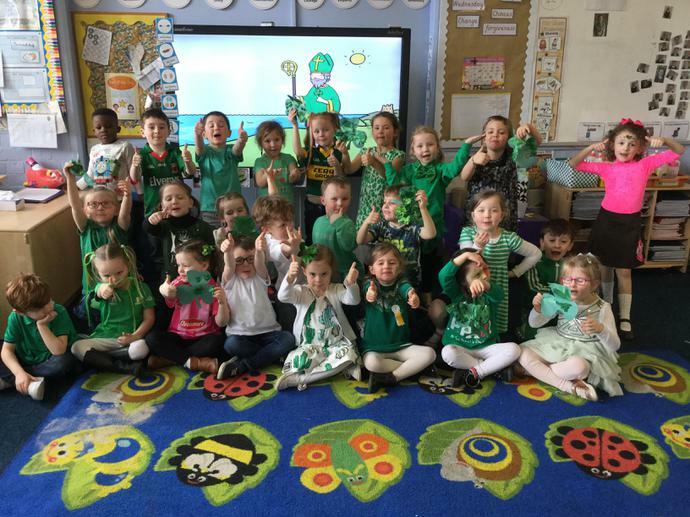 On Friday afternoon Acorns reflected upon the ways that God made us all unique and special to him. 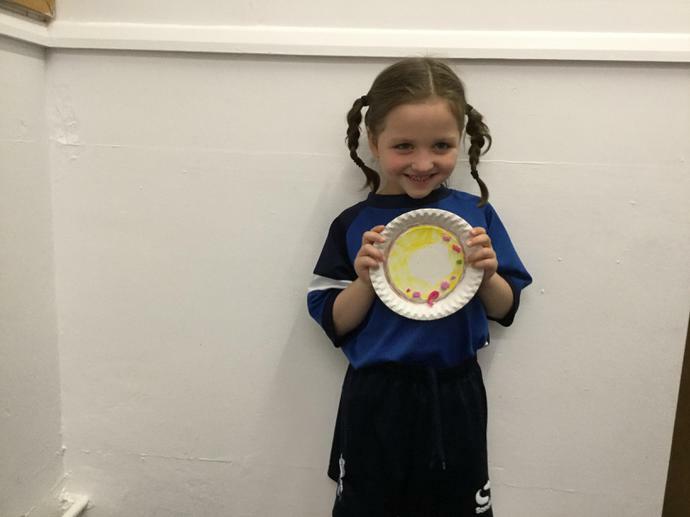 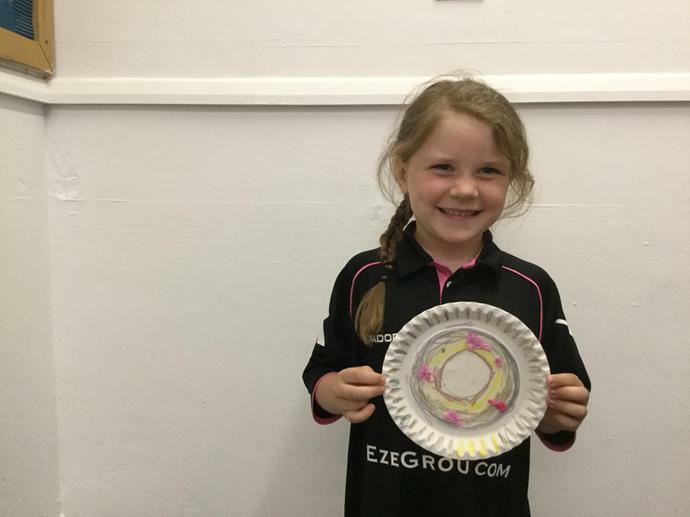 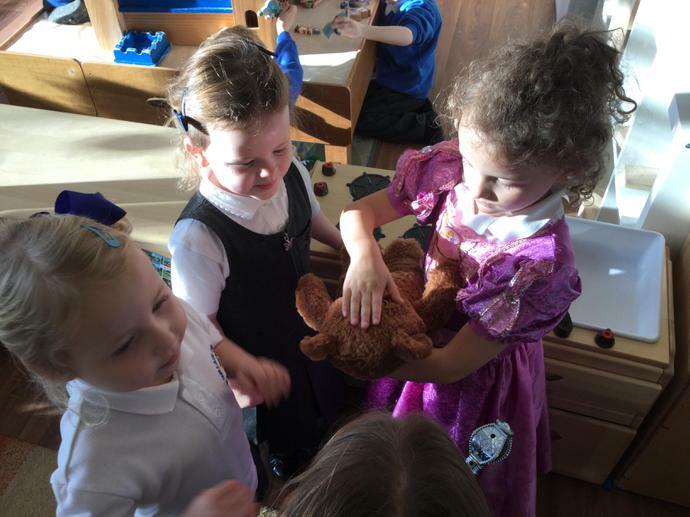 We told Coco why we think God made us all look different and like different things. 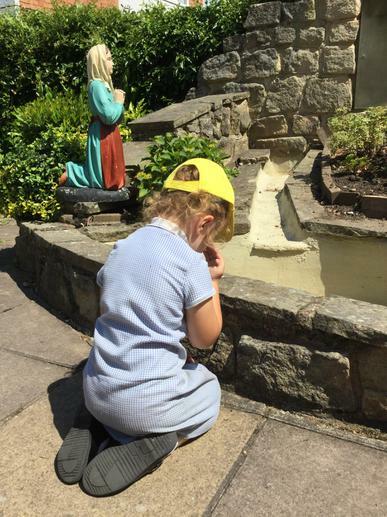 We know we all have something special to offer and we will try to use our unique gifts to praise God. 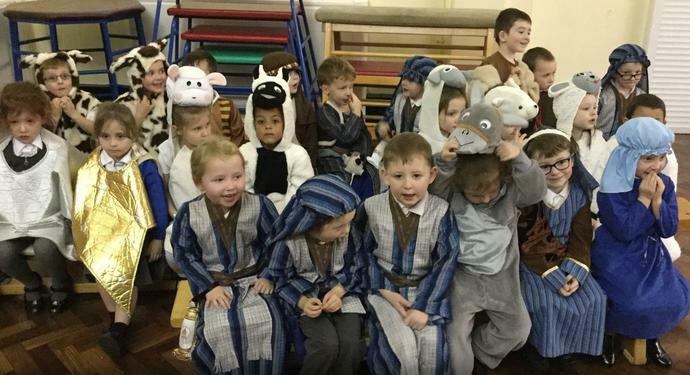 Acorns and Conkers have been working hard during their nativity preparations. 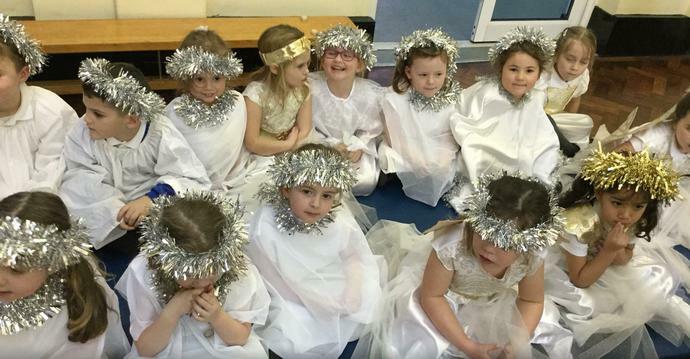 We want everyone to know and love the real Christmas story. 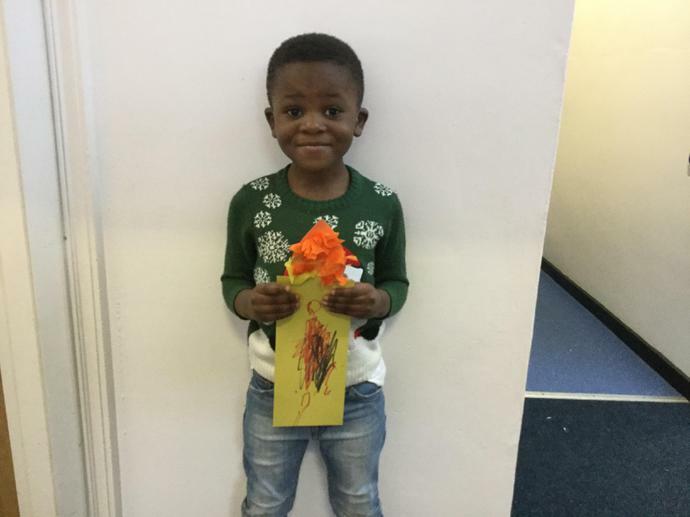 We are looking forward to celebrating Jesus’ birth on Christmas Day. 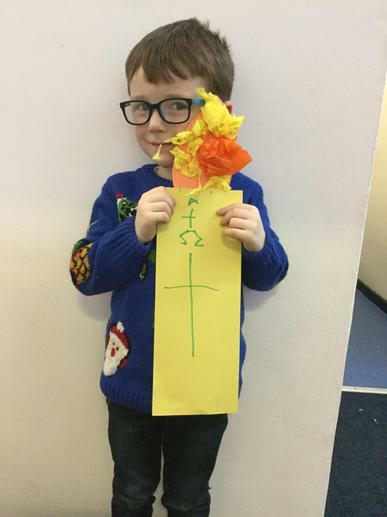 As part of our Advent preparations we have made Advent wreaths. 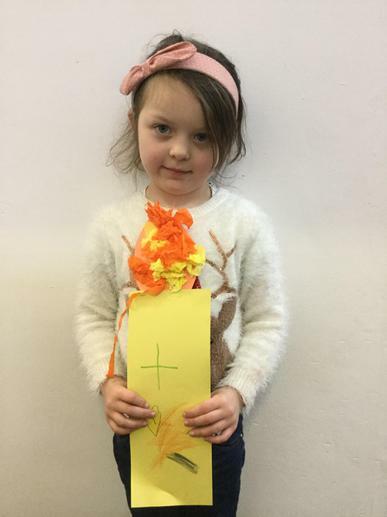 We know that as each candle is lit we are getting closer to the birth of Jesus. 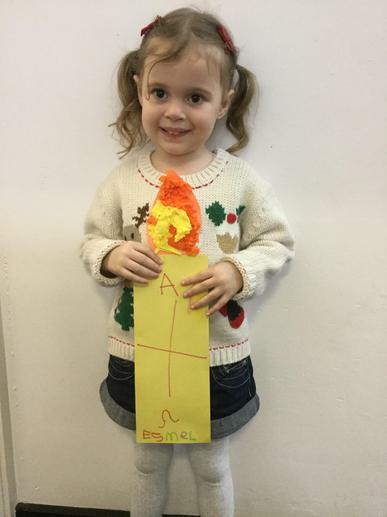 Dan and Emily came to teach Acorns class all about the real meaning of Advent. 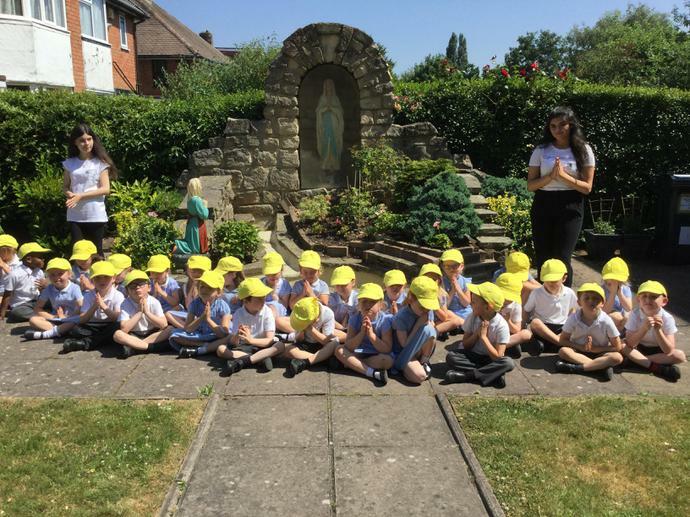 We enjoyed hearing about how Mary said yes to God. 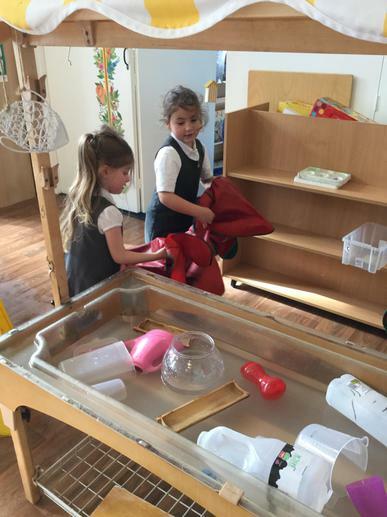 We will think about how we can say yes even when something is challenging. 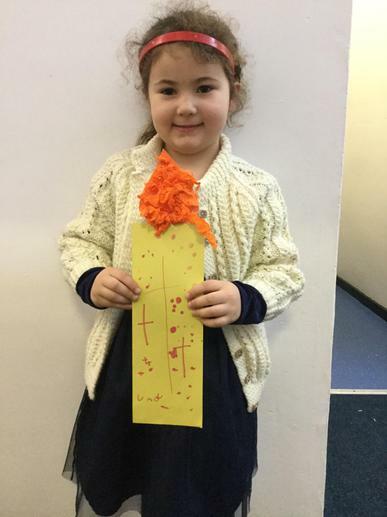 We have been learning about Jesus presentation in the temple. 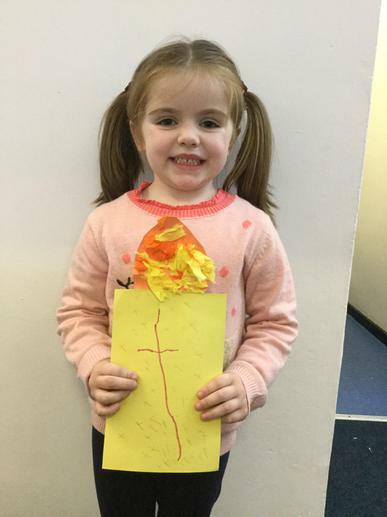 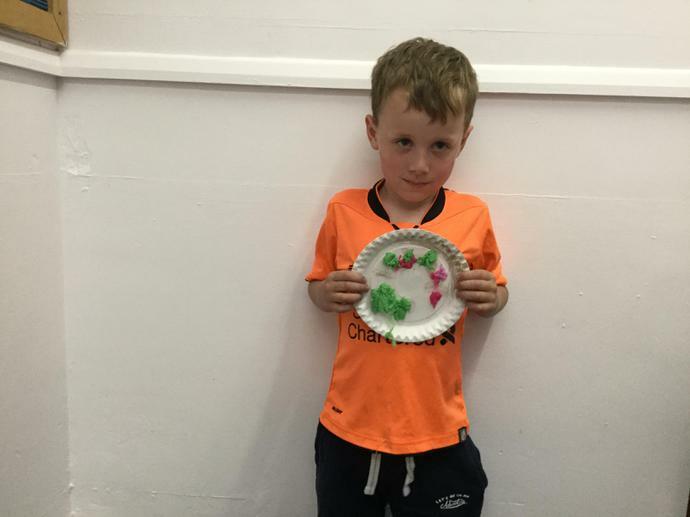 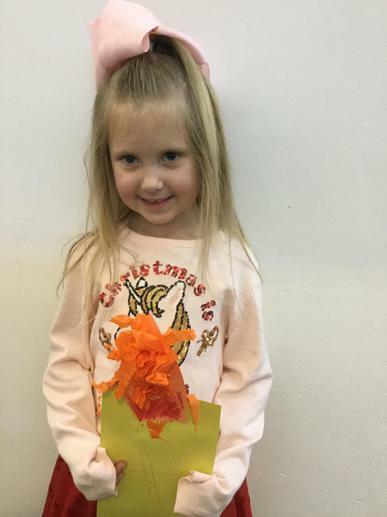 We made candles to show that Jesus is the light of the world. 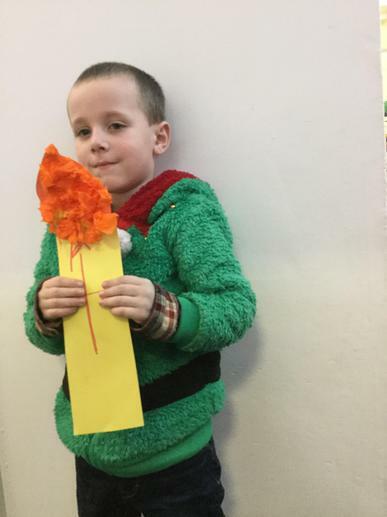 We thought how we can be a light to others. 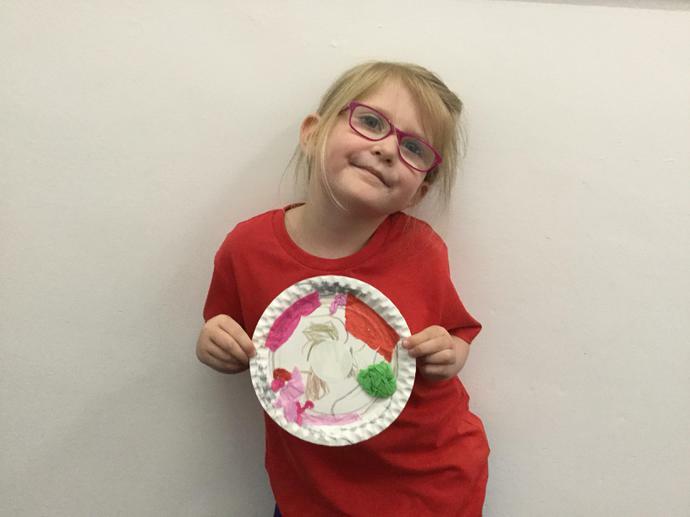 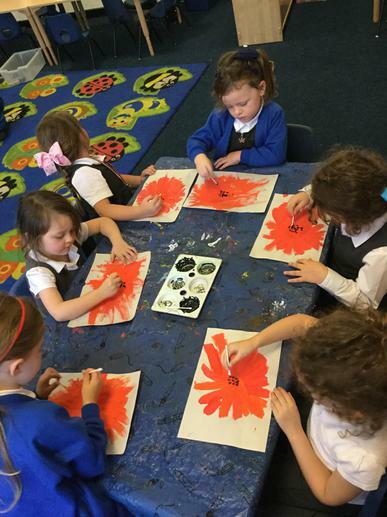 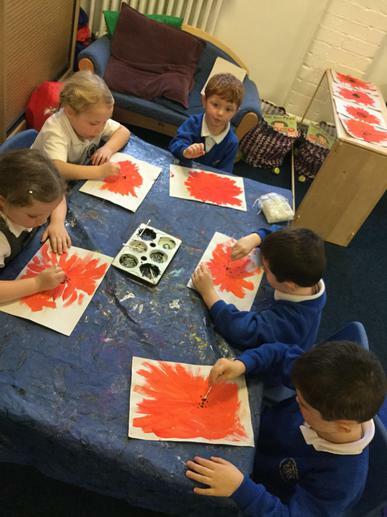 The children have been learning about poppies as a symbol of Remembrance. 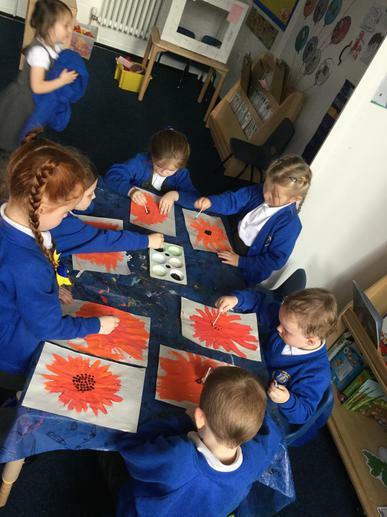 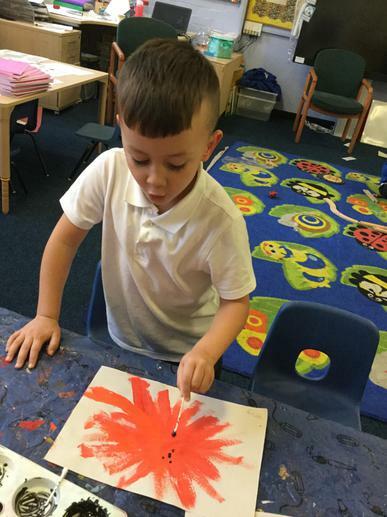 During their painting they talked to their friends about what the poppies mean to them. 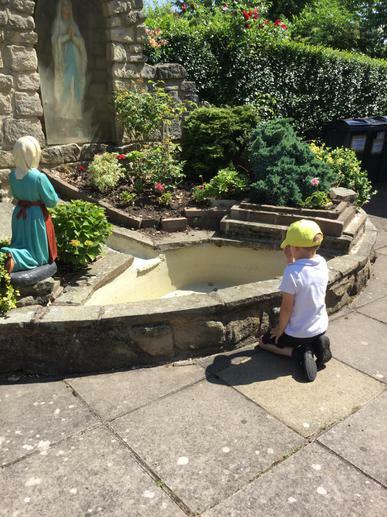 We have been learning about the presentation of Jesus and the important role that Simeon and Anna played in spreading the good news.